32 bars reels or jigs. A1 in the description above is different from the description in the magazine (see image below), and the composer is not certain. Herbie Gaudreau had a monthly column "Contra Corner" in the square dance magazine, "The New England Caller" from 1955 to roughly 1967. That magazine is now archived online at SDFNE and The Northeast Square Dancer. The down-the-hall version appeared in the May 1955 issue, page 33. However it doesn't say that Herbie composed it, only that he called it. The ladies' chain version appeared in the November 1960 issue, page 48. It's marked as "East Meets West (revised)". Thanks to Chris Page for the information above. 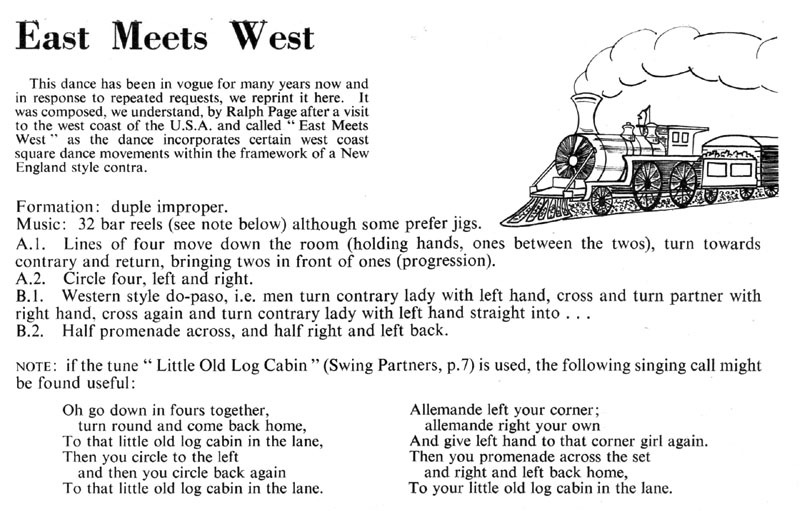 The EDS page below is the older version, even though it is four years after the revised version was published, and this article attributes it to Ralph Page. The revised version, with Herbie listed as the composer, was published again in Zesty Contras in 1983 with the note, "Only a decade ago this was a very innovative dance." I can understand why the A1 was changed as the transition from R&L Thru into Lines of Four doesn't appear to be particularly smooth!